Der Artikel Friedrich Kiel (1821-1885): Klavierkonzert B-Dur op.30 wurde in den Warenkorb gelegt. Music in Germany in the later 19th century found itself divided into two camps; the modernists, led by Liszt and Wagner, and the traditionalists who took Brahms as their model and who upheld the values of the classical period and Beethoven in particular. 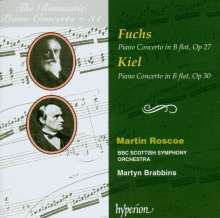 Fuchs and Kiel are very much in the later camp and both spent their lives in academic posts, as so often befits such establishment figures. They each wrote only one piano Concerto and, as one might expect, these are not vehicles for empty virtuoso display but rather ›symphonic‹ concertos, both written in the traditional three movements, the first of which is a weighty sonata form allegro. 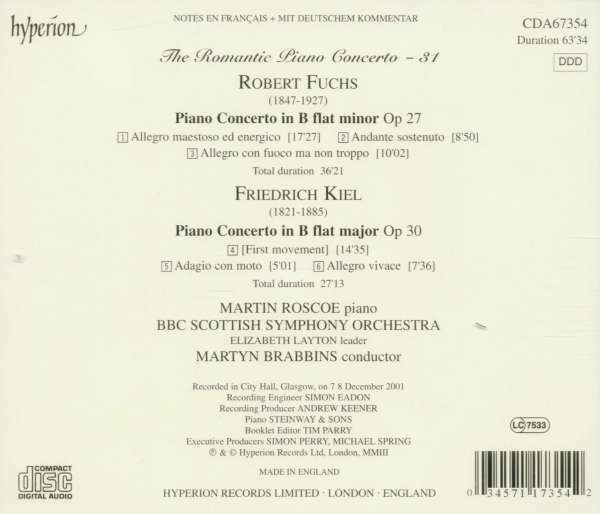 The influence of Beethoven can be heard in each and the later Fuchs piece also shows a debt to Brahms. Interestingly Kiel taught Stanford while he studied in Germany and indeed these composers are very much the German equivalent of Stanford or Parry. Martin Roscoe, who did such a fine job with the similar Brüll concertos (CDA67069), is our soloist and Martyn Brabbins and the BBCSSO give their usual inspired accompaniment. Both works are premiere recordings.